The Prophet Muhammad, Allah bless him and give him peace, was simultaneously the most beloved created being to God, and the most caring, and compassionate created being to all of creation. In these lessons Shaykh Faraz Rabbani looks at the heart of the Prophet, Allah bless him and give him peace, to draw inspiration from the lofty states of the Prophet, and how they manifested through his character and affected those around him, and how they will continue to do so even on the Day of Resurrection. This unmissable course shows the perfect balance between spiritual refinement and gracious dealings with people. span style=”font-weight: 400;”>How would such a heart treat a friend? What about foes? What effect would this heart have on loved ones? What effect would this heart have on animals and inanimate objects? Would you not yearn to have a special place in that noble heart? Would you not want to be with the possessor of that heart? Would you not want to have such a heart? 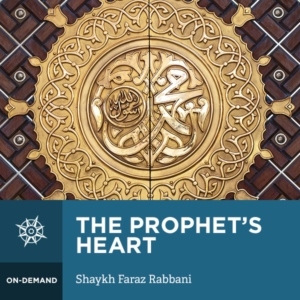 Join Shaykh Faraz Rabbani as he explains the beauty of the heart of the Messenger of Allah, blessings and peace be upon him, through the hadiths compiled by Imam al-Tirmidhi in his book al-Shamaʾil. These lessons will unlock the beautiful states of the Messenger of Allah, blessings and peace be upon him, as he was towards the Creator and His Creation. Imagine the greatest, most beautiful being created by Allah. Created to be the embodiment of all the virtues found in revelation. Created to be a manifestation of beauty, kindness, mercy, love, and much more. How would such a heart be? How would such a heart devote itself to its maker? How would it manifest gratitude, love, devotion, and its inherent need of Allah? How would such a heart be towards other people? How would its kindness be manifest towards other? Who would it direct its kindness to?